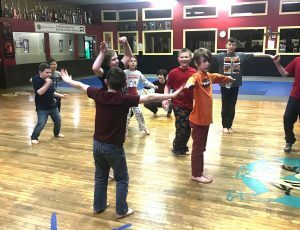 With Valentine’s Day having just passed, the TAMA Booster Club decided to throw a Martial Arts Date Night at TAMA in order to allow busy parents to enjoy a rare night out without having to worry about their kids. The event, after being given its blessing by Grandmaster Taningco, was planned by volunteers of the Booster Club, including parents and staff. The schedule of a parent is hectic. Not being a parent myself, but being the eldest sibling of three girls, I find myself growing all the more sympathetic towards my own parents the older I get. Between my own work-schedule and training at TAMA, I cannot imagine balancing my own life, constantly running around children, and expecting to have any semblance of a personal life dedicated to enjoying an evening. When I passed on the news to some of the kids, their reactions ranged from excited to humorously confused. One of them, horrified, was under the impression that it was his own date night that his parents were paying for. In actuality, the parents would drop off their kids ($20 for the first, $15 for the second, and so on) in a 5:30 to 6:00 window of time. 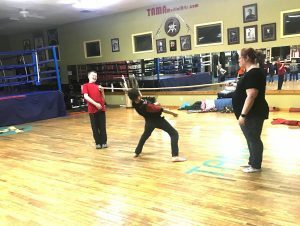 From there, the parents would go out to enjoy a date, and pick up their children anytime from 9:00 to 10:00 in which we call it martial arts date night held at Tama martial arts center. The fees (as well as generous donations) paid by the participating parents this year will go towards TAMA’s karate competition team, headed this year by black belt/instructor Greg Dinsmoor. While the team is free for any TAMA member to join, the karate competition team often faces travel expenses, and team members have to pay participation fees for each competition they enter. The money will be a welcome source of assistance for team members who may not otherwise have the chance to compete in the MVTA tournaments. The night itself was a huge success; we had sixteen participating children, and the age range was under two years old to thirteen. We played games (monkey in the middle, dodgeball, freeze-dance, and a thrilling game of limbo), ate pizza, and finished the night watching The Incredibles 2. When it came time for pickup, some kids were actually reluctant to leave, but bedtimes are a hard thing to contest. Special thanks go out to our volunteers (especially Sue Calton, for her behind-the-scenes organization and advice, and Crystal Wetzel for taking responsibility of leadership for the night), and to Grandmaster Taningco for his blessing/allowing us to use TAMA’s space for our martial arts date night. And once again, thanks to the participating parents. We hope you had a fun Valentine’s Day celebration. We certainly did!